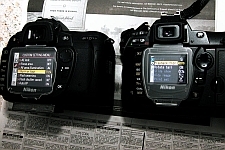 Nikon D70s/ D70 vs Nikon D80 — another favorite topic of discussion, especially among current owners of the D70 / D70s. First, speaking from experience, the D70 is a camera that you’d need to coax and tweak to produce the type of pictures “the majority” would prefer, that is, bright and colourful. Images from the D70 in default settings tend to be on the “dull” side, a bit dark, with a slight greenish tint. Good news then, that Nikon has tuned the D80 to produce much more pleasing images in the default modes. Luxun54 upgraded from a D70 to a D80, and is happier with the better high-ISO images from the D80. He posted links to 100% crops from ISO800 and ISO1600 images, and talks about the test methodology. The 1/500 sec flash-sync capability of the D70 / D70s is sorely missing from the D80. It’s not all bad news though, as absence of this feature is made up by an improvement: the D80 has less tendency to produce blooming in images — read this Imaging Resource excerpt for more details. A laundry list of improvements in the D80 vs the D70 from a D70 owner’s perspective: lower noise, better automatic white balance, more dynamic range, better infrared (IR) suppression (so black fabrics stay black), better dynamic range, ISO100. RGB histogram helps to tame reds, and green colors are better reproduced in the D80 than the D70 / D70s. AlbieSky is happy to note that his decision to upgrade to the D80 was a correct one, as he’s now enjoying better colors, white balance and high ISO performance. Ex-D70 owner lists the positives on the new D80: 11-point AF, bigger viewfinder, better high-ISO images, 10MP resolution giving more detail in images, and the ability to set the maximum ISO value (eg ISO800) for the Auto-ISO function. Teru has no qualms now shooting high-ISO images with his new D80, compared to his old D70. The D80 also allows the built-in flash to contribute illumination to a scene in commander wireless flash mode. ISO100 capability is also a huge bonus. The larger LCD on the D80 vs the one on the D70 really makes for a more enjoyable photographic experience. View the LCD size comparison image here. Read more at Nikon D80 compared with other cameras.